International Journal of Research in Health Sciences,2018,6,1,9-13. 1Assistant Professor, Department of Pharmacology, Dr.P.D.M. Medical College & Hospital, Amravati, INDIA. 2Professor, Department of Pharmacology, Chintpurni Medical College & Hospital, Pathankote, INDIA. 3Professor, Department of Pharmacology, G.M.C, Udaipur, INDIA. 4Professor, Department of Pharmacology, MDC, Durg, INDIA. This study has recruited 295 uncomplicated Type-2 diabetes mellitus patients who were allocated to two treatment groups viz group A and B. Group A received Sitagliptin and group B received Glimepride respectively. The most common admitting outcomes assessed were glycemia control, and the incidence of complications. The mean blood glucose levels (fasting and postprandial) obtained a day before starting the treatment has significantly(P<0.05) reduced when compared to mean blood glucose levels (fasting and mean postprandial) obtained after the treatment in patients who received sitagliptin. However, a significant (P<0.01) but gradual decrease was noted in mean blood glucose levels from zero month to six month in a group who were treated with Glimepride alone with comparatively high incidence of hypoglycemic episodes as compared to Sitagliptin group. In addition a significant difference (P<0.01) in HbA1c was also recorded in patients who were treated with Glimepride alone whereas insignificant difference (P>0.05) in HbA1c was recorded in patients who received Sitagliptin alone. 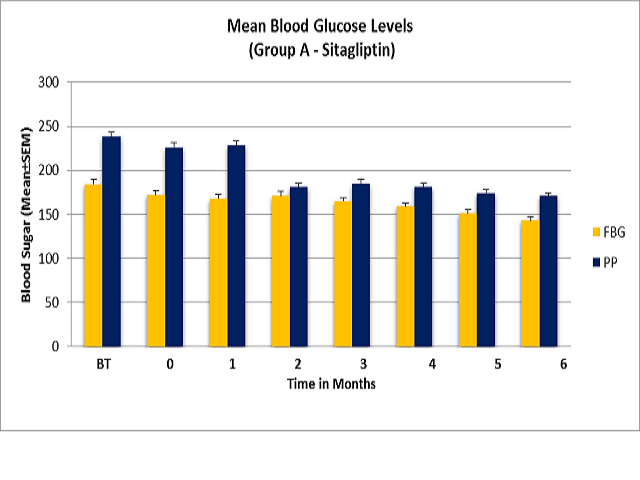 The results of this study reveals that a better glycemia control was achieved by Glimepride with comparatively higher incidence of hypoglycemic episodes than Sitagliptin alone in the management of uncomplicated type-2 diabetic patients. Comparison of mean fasting and post prandial blood glucose levels. FBG= Fasting Blood glucose, PP= Post prandial, BT= Fasting Blood Glucose Before Treatment.